I was making this recipe on Christmas Eve this year, when I realized that I make this every year as an appetizer when friends and family come by during the holidays. It is always well received by company. I make it other times during the year, too, when I need a quick and easy appetizer that's sure to please. The beauty of this recipe is that you don't have to follow it verbatim. If you don't have one of the less important ingredients it doesn't really matter. You can skip it or put in a substitute. You just need the basics though. You can also make this 1 or 2 days ahead of time and keep it covered in the fridge. Let it sit out for a few hours before serving. 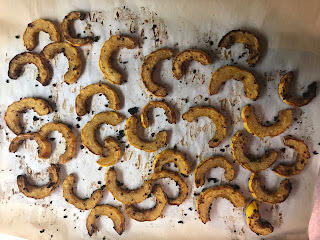 It's a bit hard to get excited about Delicata squash. I can understand that. 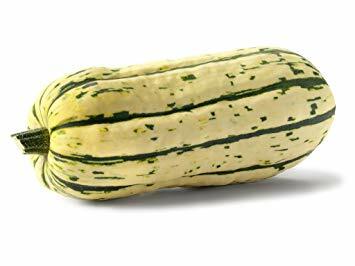 It's also the kind of squash that many people likely pass by because they know it's a squash but they don't really know what to do with it. But once you master how to draw the best elements of this squash, you will be a convert. 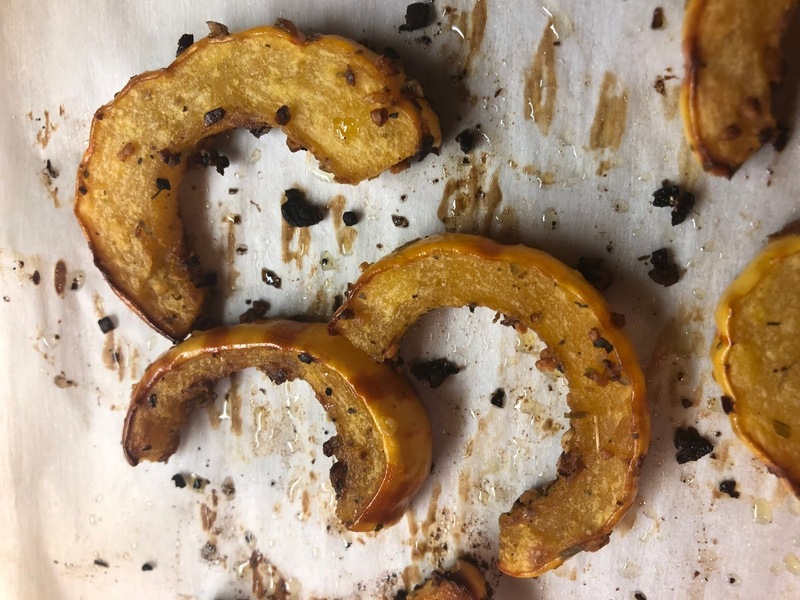 The trick is to roast the squash to draw out and intensify the creamy flavors and textures. You want to get some color on the squash. Some browning (and even a little bit of black) really helps. The crisp and crunchy exterior mixed with the smooth, creamy inside almost resembles eating french fries. It's also simple to prepare. You eat the skin so there's no peeling involved. All you have to do is scoop out the seeds and membranes in the core. Finally, it's a side dish that can easily complement whatever your main dish is. 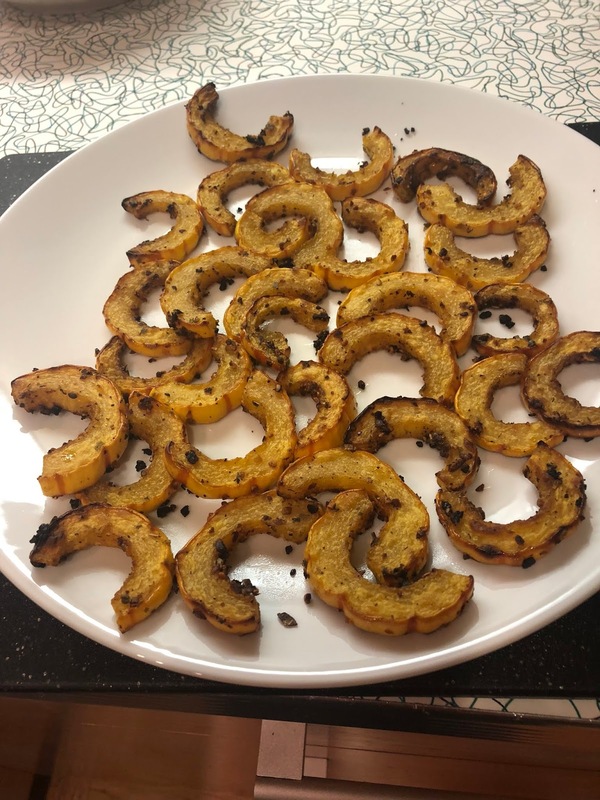 This is because you can use any variety of seasonings you want on the squash. If you are using a particular seasoning on your main dish, add the same to your squash. For this preparation, I added some roasted garlic powder and a seasoning mixture from Penzey's spices along with the salt and pepper. 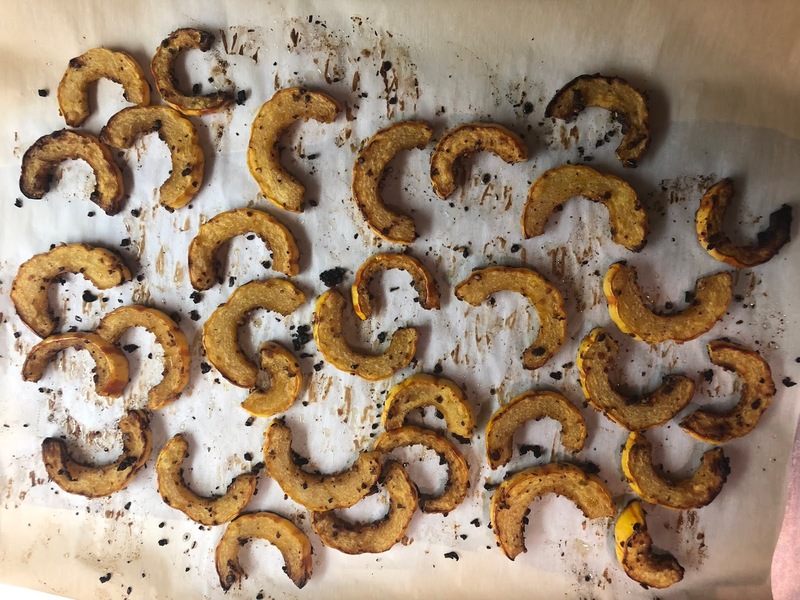 If you're new to Delicata squash, start simple and then begin to experiment on future preparations. Thoroughly wash the outside of the squash (you're going to be eating it after all). Let dry before preparing. 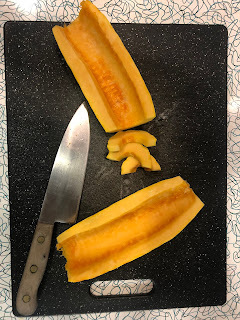 Cut off the stem and the tip of the bottom. Cut in half lengthwise and with a spoon scoop out the seeds and the membranes. Scrape the spoon along the flesh and try to get a smooth surface on the squash. A common side dish in this house is Brussels sprouts. Most often I prepare them in the skillet--either halved or shredded. Both are great methods to prepare them. Most recently, I've been roasting them in the oven. 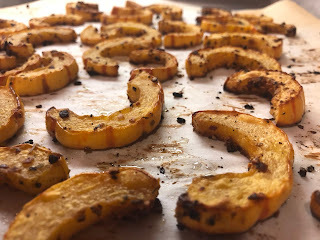 Roasting allows for crispy edges and you can season them however you like. You can experiment with different seasonings to find something that you especially like. Now if you think you don't like Brussels sprouts, you're probably recalling the bitter vegetable that you were forced to choke down over the holidays. But over the last quarter century, farmers have been selectively breeding them to reduce the bitter compounds (glucosinolates) that have turned you off of this healthy vegetable. It's time to try them again. Brussels sprouts are high in Vitamin K and C and also provide protein. Prepare Brussels sprouts and put them into a quart-sized plastic bag. Add to the bag the olive oil, salt, pepper, and your favorite seasonings. Shake the bag (Shake and Bake style!) to coat the Brussels sprouts with the oil and seasonings. This time, the seasonings I added were some roasted garlic powder and some of Penzey's Mural of Flavor. 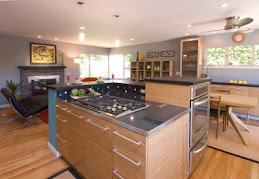 This is where you can experiment with various seasonings to find a few variations that you like. Add a bit of soy sauce for an Asian twist. Add a bit of your favorite hot sauce if you like. You can try it out with a different seasoning mix each night. But never omit the salt (unless you are under doctor's orders) as the salt helps a great deal with the flavor. Place the coated sprouts face down on a baking sheet and pop them into the pre-heated oven. Every 5-10 minutes give them a stir. Cook 30-40 minutes depending on how blackened and crispy you want them. When finished, remove from the oven and let cool for a bit. Sprinkle with some finishing salt and more pepper and serve as a side dish. Another technique is to add some grated Parmesan cheese (actual cheese, not the stuff in the green can) during the last few minutes of cooking. This is a quick, easy, healthy, and tasty weeknight salad that I recently adapted from a Cooking Light magazine and I've made this recipe a few times now. Use this as starting point and tweak it to your liking. I made a number of changes to the original recipe. But we picked this recipe to try because of one ingredient: roasted garbanzo beans! Now the concept of roasting garbanzo beans is a new to us. We like them and there are always a few cans in the pantry. But roasting these things turns them into something dangerously addictive (in a good way!). They are THAT good. Suddenly, they are tasty nuggets that are meaty and chewy. They are utterly transformed and vastly improved. It's an amazing transformation. We got introduced to the concept through a Blue Apron recipe. The roasting of the garbanzo beans seemed like an unnecessary step but I thought I would just follow the recipe. Once they cooled enough to try one I was hooked. It was hard not to keep stealing a few as they cool. They could stand on their own as a healthy snack food. The recipe also includes some parsley pesto. I have a go-to recipe for traditional pesto with basil. I make batches of it during the summer months and then freeze them in ice cube trays to use throughout the year. I've also made pesto with other ingredients including parsley, carrot top greens, arugula, and cilantro. 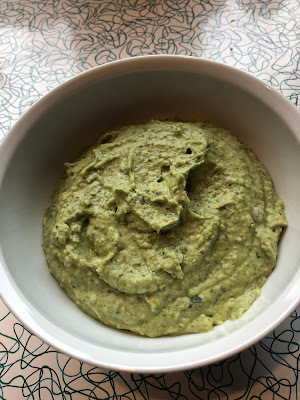 Parsley pesto is a nice, mild pesto and it's great to have some on hand frozen. Defrost a cube to add to eggs, fish, or chicken if you eat meat. So I have multiple bags of various types of frozen pesto cubes in the freezer at the ready. Finally, the original recipe called for some pulled chunks of rotisserie chicken. Since we don't eat meat, we substituted Tofurky's tasty "Slow Roasted Chick'n." This has been another revelation. This chicken substitute is pretty dead on and it has opened up some new recipes for us to try. Combine first five ingredients in a food processor bowl. While processing, slowly add olive oil until you reach the desired consistency. To preserve for the future, spoon pesto into oiled ice cube trays and freeze overnight. The next day, set out for a few minutes and then separate the cubes from the trays. Place cubes in freezer bags and store in the freezer for future use. For this recipe, use 3-4 frozen cubes of parsley pesto. Drain and rinse the beans then place them in a single layer on a doubled paper towel. Cover with paper towels and let them dry completely. Transfer beans to a large bowl and add olive oil, salt, and pepper and stir to mix. Place beans in a single layer on a (parchment paper lined) cookie sheet and place in pre-heated oven for 20-22 minutes. Roll beans over halfway through the cooking time. Watch the beans closely during the last few minutes. Remove when done and let cool. Place the chicken (in whatever form) in a skillet with a little olive oil over medium high heat. Cook until there's a some browning on both sides. In a large mixing bowl, combine arugula, edamame, roasted garbanzo beans, and cucumber. Mix in parsley pesto and stir to coat the ingredients with the pesto (it's actually better to mix by hand to get a nice coating on everything). Drizzle with some olive oil if you think the mixture seems dry. Divide the mixture between serving plates or bowls and top with the cooked chicken. The backyard lemons continue to be in full bloom. As in the last post, I am always looking for ways to use up the backyard bounty of lemons. 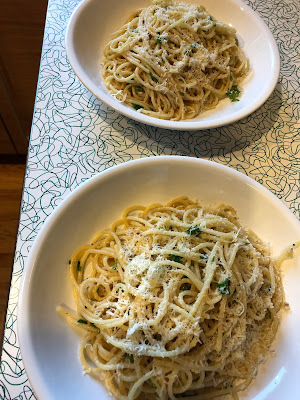 I got this recipe via email from my Milk Street subscription. What appealed to me were the simple ingredients, quick preparation time (hello weeknight meal! 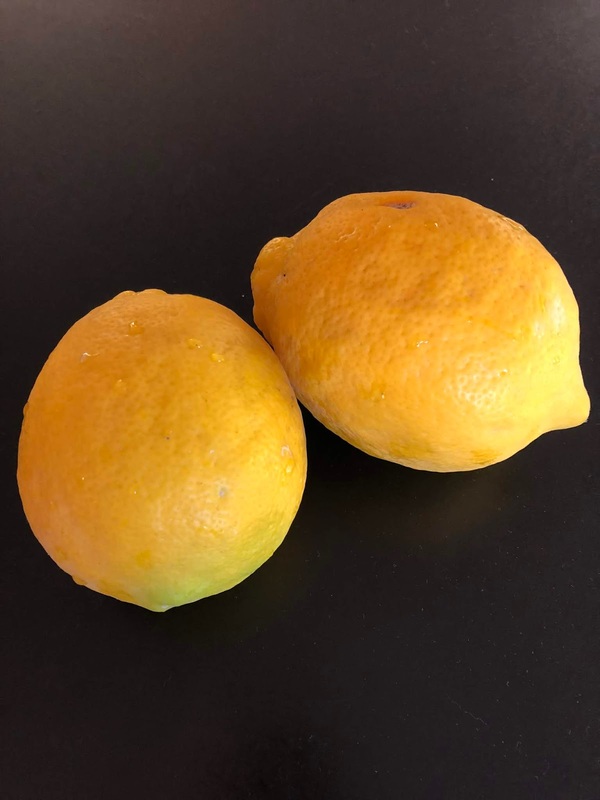 ), bright flavors, and the use of a lemon. With this recipe, I also appreciated the use of starchy pasta water along with a generous bit of butter to thicken the sauce instead of some recipes which call for cream. This leads to a cleaner, lighter, and brighter finish. 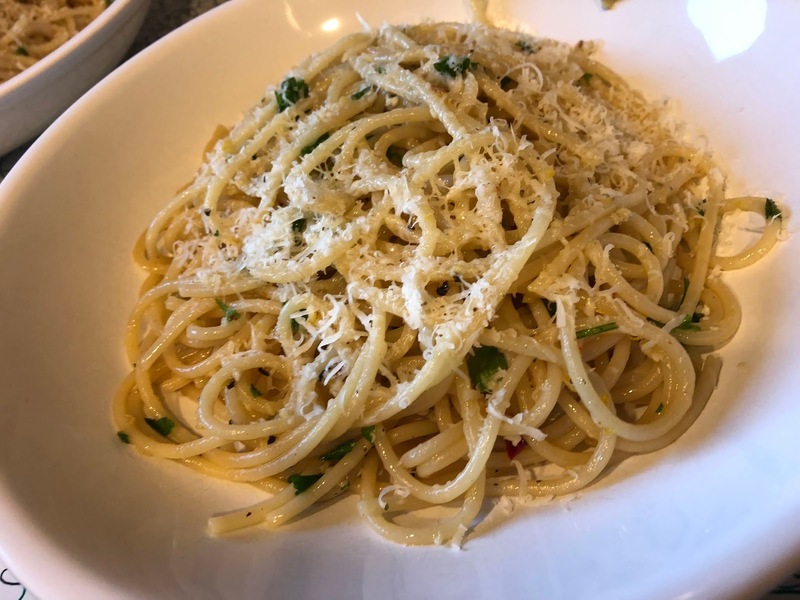 This Italian-based recipe comes from the Campania region of Italy where there is an abundance of lemon trees along the Amalfi Coast. Prep lemon zest, herbs, and mince garlic. Preheat 2 quarts of salted water for pasta. In a large skillet, melt 3 tablespoons butter (I also added some olive oil to the mixture). Add the minced garlic and cook stirring for about 30 seconds. Add the white wine and simmer until reduced, about 3 minutes. Remove from heat and set aside. Bring pasta water to a boil. Cook the pasta until 2-3 minutes short of the directions (pasta will continue to cook later in the skillet). Return the skillet to medium high heat, stir in the reserved pasta water, and bring to a simmer. Add the drained pasta and stir to mix. Lower the heat until gently simmering. Add 2 remaining tablespoons of butter, a very generous grind of black pepper, the lemon juice and zest, and the parsley. 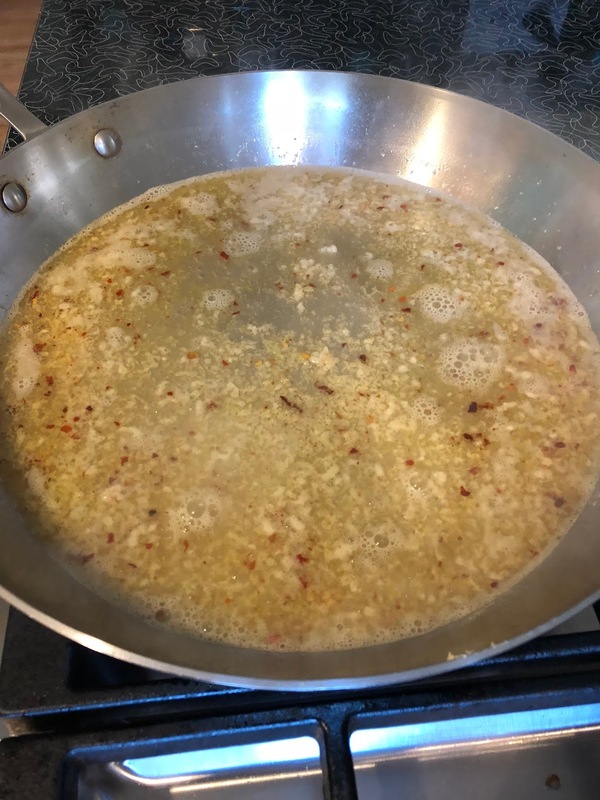 Continue to simmer until the sauce has thickened and the extra water has evaporated. This is a key step. You don't want a watery sauce so simmer until the pasta glistens with starch and fat and the sauce has thickened. With the weather warming up and no more rain in the foreseeable future, it's time to start exploring some warm weather cocktails. Add to that a lemon tree in the backyard bursting with lemons. 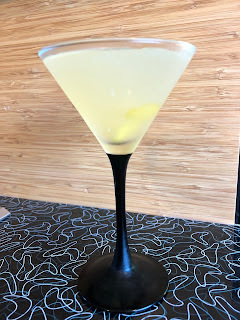 I was recently introduced to this drink through a friend who saw the recipe in a recent issue of Food & Wine magazine. Like me, he has a lemon tree and is always looking for ways to use them up. The drink is a nice balance of tart and sweetness with neither dominating the drink. 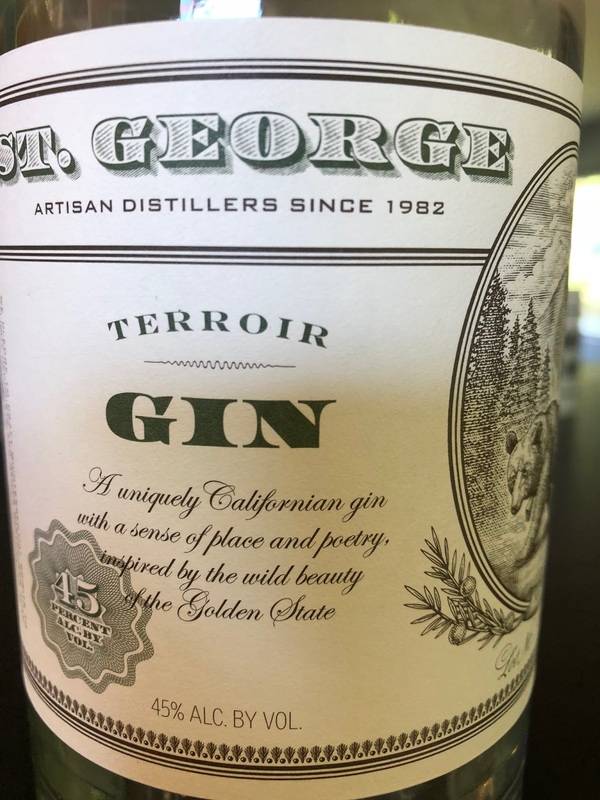 You can use any type of gin. 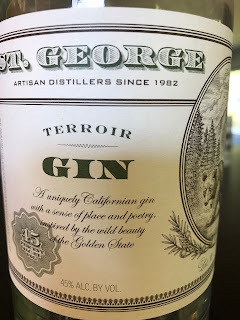 I opted to use a St. George Terroir Gin that was given to me by a friend. The first step is to chill a glass in the fridge ahead of time so it's ready when it's cocktail time. 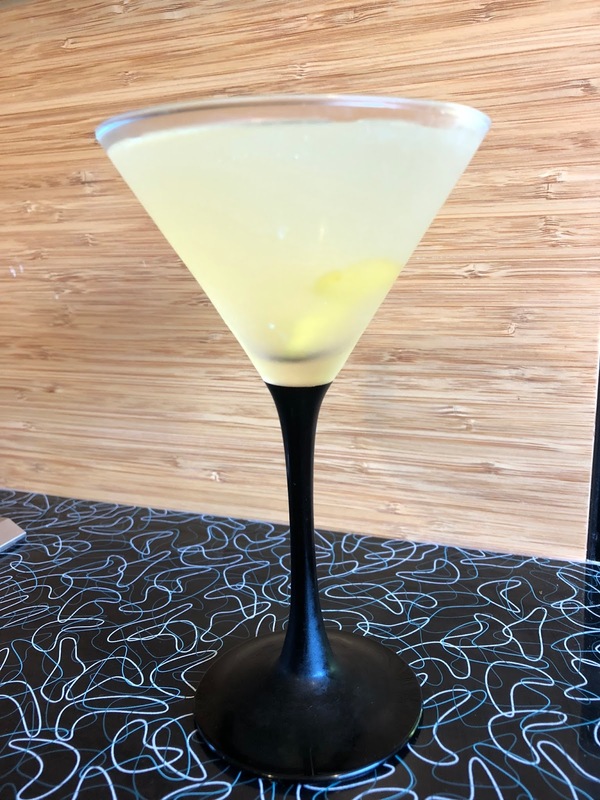 The recipe calls for a coupe glass but I didn't have any of those and used a traditional martini glass instead. Also, honey can be difficult to work with due to its viscosity. So make a honey syrup (not unlike simple syrup) with equal parts honey and water. Either use a stove top or microwave to mix the ingredients together. It will keep in the fridge for a while. 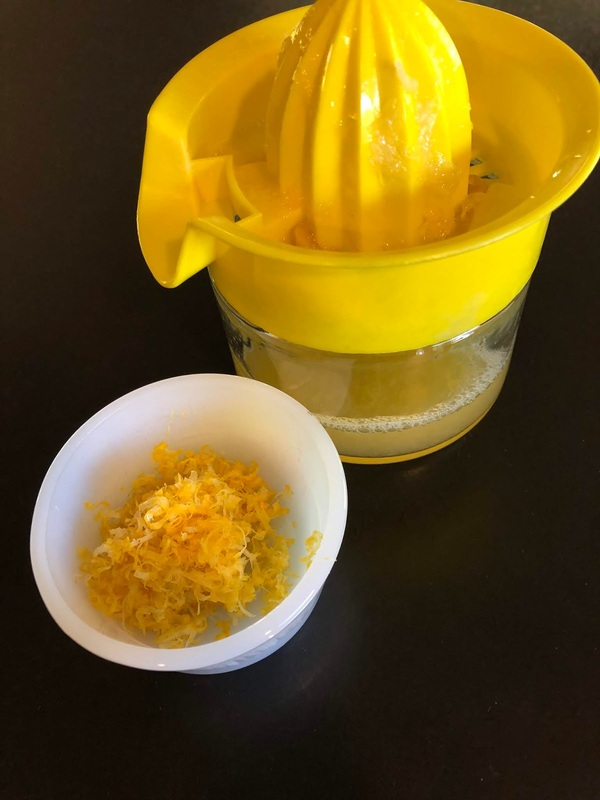 Place all ingredients in a cocktail shaker. Fill with ice and shake well. Strain the drink into a chilled glass. 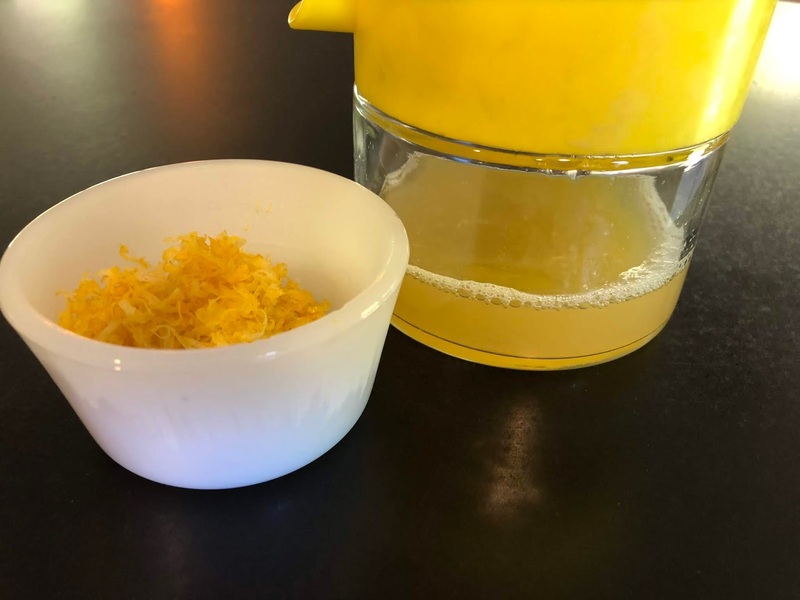 Make a garnish of lemon peel and add it to the drink and serve. The best Christmas gift we got was that our downstairs room remodel is basically done. The final inspection is scheduled for tomorrow. There are a few items on the punch list, but we have begun to move the furniture in. We even watched a football game on the TV with the fireplace below warming the room. The shelves are mostly empty and there are additional details we want to add but it is finally a usable room. This whole project got started one year ago. Rain delayed the foundation work for months on end which then delayed the interior remodel. But we are finally happy with the finished product. My New Year's resolution is to return this blog to the topic of food and cooking. I have new cookbooks and new ideas to share in 2018. Pescetarian. home grown food from my backyard, the farmer's market, and the Community Supported Agriculture (CSA) box we get each week prepared in our remodeled mid-century ranch house.